Sharing a bedroom will be much more fun with one of our log furniture bunk beds in your choice of pine wood, red cedar wood or aspen wood. This one of a kind Amish handcrafted bunk bed is sure to make your little boy or girl smile with delight! 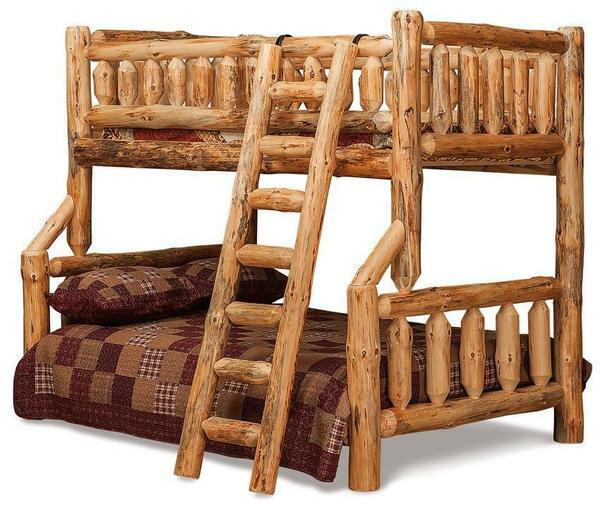 Your little one will feel as if they have a log tree house bed in their bedroom! They will never complain about bedtime again. Choose to have this bunk bed built in twin over twin or twin over full size. You will be very impressed with the quality of our Amish bedroom furniture and kids furniture. Call one of our sales associates today with questions or ordering assistance or stop by our Amish furniture store in Sarasota, Florida. Twin over Twin Dimensions: 47" x 84" x 72"
Twin over Full Dimensions: 63" x 84" x 72"